In his reflections before praying the Angelus, on this Sunday during Christmas, the Pope spoke of the Holy Family of Jesus, Mary and Joseph. Today is the Feast of the Holy Family, and the day's readings of the liturgy are about families. He spoke about the Gospel accounts of Jesus and his family when he was a child, calling them "the prototype of every Christian family," and speaking of what families of today can learn from them. Asia News has an article about the Pope's reflections. Full translations are available from Zenit and from Teresa Benedetta at Papa Ratzinger Forum. 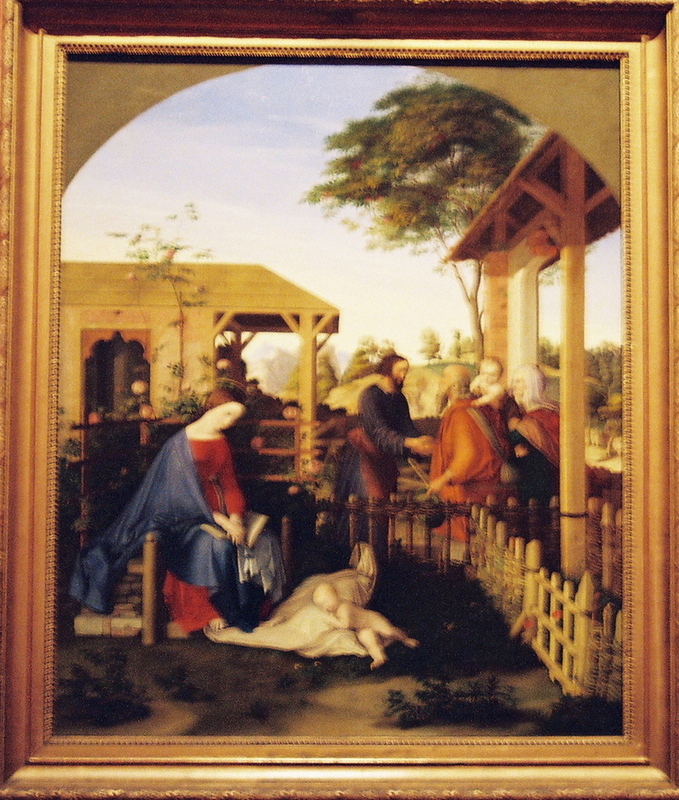 "Mary and Joseph educated Jesus, above all, through their example. From His parents, He learned all about the beauty of faith, of love for God and His Law, as well as the demands of justice which find fulfillment in love (cfr Rom 13,10)." Our Audience today is filled with the joy of Christmas, the mystery of God’s eternal Word made flesh for our salvation. Down the centuries Christians have contemplated this mystery of light, seeking to understand more fully why God chose to become man. An answer to this question can be found in the joyful song of the angels on the first Christmas: "Glory to God in the highest, and peace among those whom he favours!" (Lk 2:14). God’s glory, shining on the face of Christ (cf. 2 Cor 4:6), brings that peace which is the crowning of his messianic gifts. Saint Irenaeus tells us that the Word became flesh in order to give us a share in God’s glory: "The glory of God is the living man, and the life of man consists in the vision of God" (Adv. Haer., 20,5,7). Ultimately, the Incarnation is the fruit of God’s infinite love for humanity; it reveals, in von Balthasar’s insightful phrase, that God is not primarily absolute power, but absolute love, a love revealed in the complete gift of himself. May the song of the angels inspire us to give "glory to God" and to build "peace on earth", by humbly receiving the gift that God gives us at Christmas: the gift of his love, the gift of his Son. "I offer a very cordial welcome to all the English-speaking pilgrims and visitors, especially the groups from Ireland and the United States of America. May your visit to Rome in these holy days be a source of spiritual joy and deepened faith in the Word made flesh. Upon you and your families I invoke the grace and peace of the New-born Saviour. Happy Christmas!" Asia News has an article with quotations. Full translations are available from Teresa Benedetta at Papa Ratzinger Forum and Zenit. "The Pope wishes that all of you, the youth, gathered in Zagreb will increasingly be aware of the importance of brotherhood among men and the necessity of opening up to all of the people who surround you. Thus, in a renewed awareness of others, you will contribute your share to the establishment of more brotherly relations, so that throughout the planet, the human family will be realized concretely, in which each person will be received and loved for himself, will be recognized and respected as a child of God. In this Croatian land, marked in past years by conflicts, you are the sign of a new hope and you show that you, the youth, want a new humanity, founded on the recognition of all people, independently from their nationality, from their religion. As Christians, marked by one Baptism which makes us all together sons of the same Father, you are called to show that the evangelical message is universal and joins all men on the way of life. By your looking to others, by your attention to each one, may you make Christ present, he who calls you to will and to do like him. It is by this that you will be truly free, and that you will live your human and Christian responsibility. "Entrusting you to the intercession of the Virgin Mary, Mother of believers, His Holiness Benedict XVI grants to you from the depth of his heart the affectionate apostolic blessing, as well as to the Brothers of Taizé, to all of the people who organized this pilgrimage, to the Pastors and to the faithful who welcome you, and to your families." Today's article in Eucharistie Miséricordeuse also quotes from a letter from the prior of Taizé, Brother Aloïs: "The time has come when we can take new steps in the construction of a new future of peace, with the Croatian youth, their neighbors and the youth of all of Europe." Brother Aloïs encouraged them to resist discrimination and to manifest a visible unity, calling them to a "common prayer." Other messages were sent to the ecumenical gathering by Kofi Annan, Secretary General of the United Nations; Bartholomew I, Patriarch of Constantinople; Alexis II, Patriarch of Moscow; and Rowan Williams, the Archbishop of Canterbury. The Program for the meeting can be found on the Taizé website, along with last minute information for participants and supplemental information for participants from English-speaking countries, as each language group has its own reception point. Some television coverage will be available in France and by satellite for the Eucharistic celebration on Sunday, December 31. Pope Benedict remembered the persecuted Church of China and Viet Nam today at the praying of the Angelus on the memorial of St. Stephen, the first Christian martyr, whose death is recorded in sixth and seventh chapters of the Acts of the Apostles. Asia News has an article. Full translations are available from Zenit and from Teresa Benedetta at Papa Ratzinger Forum. The meaning of the phrase "martyrum candidatus exercitus" is explained in the Catholic Encyclopedia under "Te Deum" and "Massa Candida". The phrase as found in the Te Deum ("Martyrum candidatus laudat exercitus") is translated "The white robed army of martyrs praise Thee." The Massa Candida is the remembrance of the deaths of 300 Christians in fourth century Carthage), who St. Augustine called the "white mass of Utica", the crowd in white raiment. The poet Prudentius wrote about it: ""Whiteness [candor] possesses their bodies; purity [candor] bears their minds [or, souls] to heaven. Hence it [the 'head-long swarm' to which the poet has referred in a preceding line] has merited to be forever called the Massa Candida." After this I had a vision of a great multitude, which no one could count, from every nation, race, people, and tongue. They stood before the throne and before the Lamb, wearing white robes and holding palm branches in their hands. They cried out in a loud voice: "Salvation comes from our God, who is seated on the throne, and from the Lamb. All the angels stood around the throne and around the elders and the four living creatures. They prostrated themselves before the throne, worshiped God, and exclaimed: "Amen. Blessing and glory, wisdom and thanksgiving, honor, power, and might be to our God forever and ever. Amen." Then one of the elders spoke up and said to me, "Who are these wearing white robes, and where did they come from?" I said to him, "My lord, you are the one who knows." He said to me, "These are the ones who have survived the time of great distress; they have washed their robes and made them white in the blood of the Lamb. "For this reason they stand before God's throne and worship him day and night in his temple. The one who sits on the throne will shelter them. They will not hunger or thirst anymore, nor will the sun or any heat strike them. For the Lamb who is in the center of the throne will shepherd them and lead them to springs of life-giving water, and God will wipe away every tear from their eyes." EWTN will re-broadcast last night's Midnight Mass from St. Peter's Basilica this afternoon. Although this afternoon's re-broadcast is not listed on their December television specials page, it does appear on this week's program grid for today at 4:00 p.m. Pacific time, 7:00 Eastern Time. To watch online, from the EWTN home page, hold your cursor over "Television", select "Live TV - English" or "Live TV - Spanish" and then choose Real Video or Windows Media. EWTN will also re-broadcast the Urbi et Orbi blessing at 7:00 p.m. Pacific Time, 10:00 Eastern Time. KTO TV has archived videos of Midnight Mass and the Urbi et Orbi Blessing that you can watch at any time, with French commentary. Click on "Regarder la Video" in the little green box to watch. "Among the many gifts that we buy and receive, let us not forget the true gift: to give each other something of ourselves, to give each other something of our time, to open our time to God. In this way anxiety disappears, joy is born, and the feast is created." "How can we not hear, from the very depths of this humanity, at once joyful and anguished, a heart-rending cry for help? It is Christmas: today “the true light that enlightens every man” (Jn 1:9) came into the world. “The word became flesh and dwelt among us” (Jn 1:14), proclaims the Evangelist John. Today, this very day, Christ comes once more “unto his own”, and to those who receive him he gives “the power to become children of God”; in a word, he offers them the opportunity to see God’s glory and to share the joy of that Love which became incarnate for us in Bethlehem. Today “our Saviour is born to the world”, for he knows that even today we need him. Despite humanity’s many advances, man has always been the same: a freedom poised between good and evil, between life and death. It is there, in the very depths of his being, in what the Bible calls his “heart”, that man always needs to be “saved”. And, in this post-modern age, perhaps he needs a Saviour all the more, since the society in which he lives has become more complex and the threats to his personal and moral integrity have become more insidious. Who can defend him, if not the One who loves him to the point of sacrificing on the Cross his only-begotten Son as the Saviour of the world?" At today's final Angelus prayer of Advent, the Pope spoke of preparing for Christmas with a new heart, remembering Christ, in whom all feel welcomed. Asia News has an article with excerpts in English. Full translations are available from Zenit and Papa Ratzinger Forum. "May his birth not find us taken up with celebrating Christmas and forgetting that He is the protagonist of the feast! May Mary help us to keep the state of inner meditation that is necessary to savour the deep joy that the birth of the Redeemer brings." 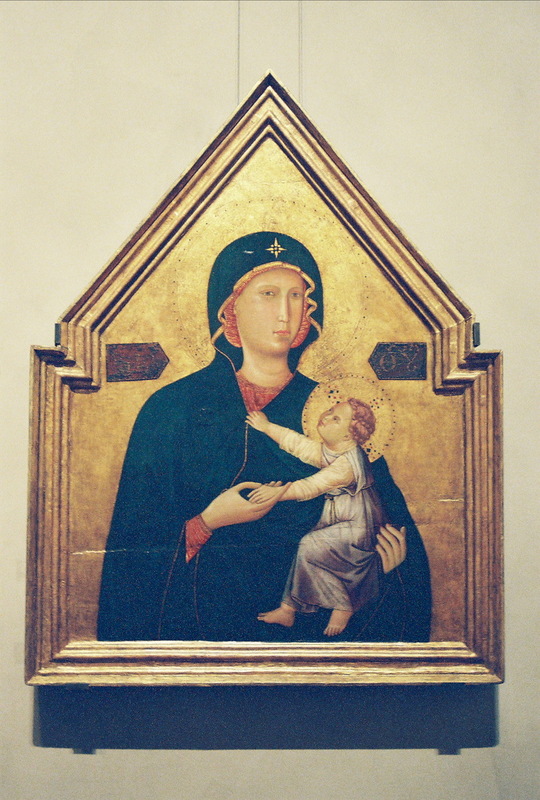 Picture: Madonna and Child, painted by a Master of St. Cecilia, Italian, 1290-1295, tempera and gold leaf on panel, at the Getty . This photo by me. Asia News today has a detailed article with quotations from the Holy Father's address today to the Roman Curia. Vatican Information Service also has such an article. Full translations are available from the Vatican and from Teresa Benedetta at Papa Ratzinger Forum. "Et erit iste pax" - 'He shall be peace', says the prophet Micah (5:4) about the future Lord of Israel, whose birth in Bethlehem he announces. To the shepherds grazing their sheep in fields near Bethlehem, the angels said, the Messiah has arrived. 'Peace on earth to men' (Luke 2:14). The same Christ, the Lord, said to his disciples: "I leave you peace. I give my peace to you" (John 14:27). From these words the liturgical greeting developed: "Peace be with you." This peace that is communicated in the liturgy is the same Christ. He gives himself to us as peace, as reconciliation across every frontier. Where He is received, islands of peace grow. We men would have wished that Christ would publicly announce, once and for ever, that all wars would be abolished, armies destroyed, and universal peace established. But we must learn that peace cannot be gained only from outside, from structures, and that the attempt to establish it by violence only opens the door to ever new violence. We must learn that peace -as the angel from Bethlehem said - is connected with eudokia, with opening our hearts to God." "Come nearer, almost on tiptoes"
"The Lord is near; come, let us adore him." "With this invocation, the liturgy invites us, in these last days of Advent, to come nearer, almost on tiptoes, to the cave in Bethlehem where the extraordinary event took place that changed the course of history: the birth of the Redeemer." So began the Holy Father's last General Audience catechesis of Advent today. In it he spoke of how all seek renewal, as we await "the advent of a Savior who renews the world and our lives the advent of Christ, who is the only true Redeemer of mankind and of every man." We wait in vigilance and prayer as it is our task to spread the truth of Christmas with our lives. An article is available from Asia News. Full translations are available from Papa Ratzinger Forum, Zenit and the Vatican. Quotations here are from Teresa Benedetta at Papa Ratzinger Forum. Christopher Blosser has a new Pope Benedict Roundup this morning. His characteristically extensive links and discussion include analysis of the Pope's journey to Turkey, recent ecumenical discussions, the Pope's books and views on inter-faith dialogue, and more. The Christmas Tree is now in place at St. Peter's Square, and today, Roman children brought the baby Jesus that will lie in their mangers in their parishes, schools and homes this year, to have them blessed by the Pope. Asia News has posted an article. Full translations are available from Zenit, the Vatican, and from Teresa Benedetta at Papa Ratzinger Forum. In reflecting on the true joy of Christmas, looking to the coming of the Lord, the Pope remembered those who have fled war torn countries in Africa and the Middle East, refugees, those who are sick or alone, and those who look in vain for joy through self-affirmation and ambition, consumerism, and intoxication. It is precisely, he said, to the wounded and orphans of life that the message of joy is proclaimed, with Christ, and salvation, rescue that is part of an inner renewal, as the source of true joy. "To transform the world, God chose a humble girl from a village in Galilee, Mary of Nazareth, and called on her in these words: "Rejoice, you who are full of grace, the Lord is with you." In those words lie the secret of the authentic Christmas. God repeats it to the chruch and to each of us: Rejoice, the Lord is near."